After banning meat, poultry & fish from my diet over 25 years ago (WOW, I must be getting old!?! ), I’m still a bit squeamish about many fishies. I started introducing a smidge of fish back in my diet a few years ago for a variety of reasons, but am incredibly picky about freshness, flavor (as in not much fishiness), and sustainability. Check out the Monterey Bay Aquarium’s Seafood Watch for guidelines of good fish choices and the big no-no’s. 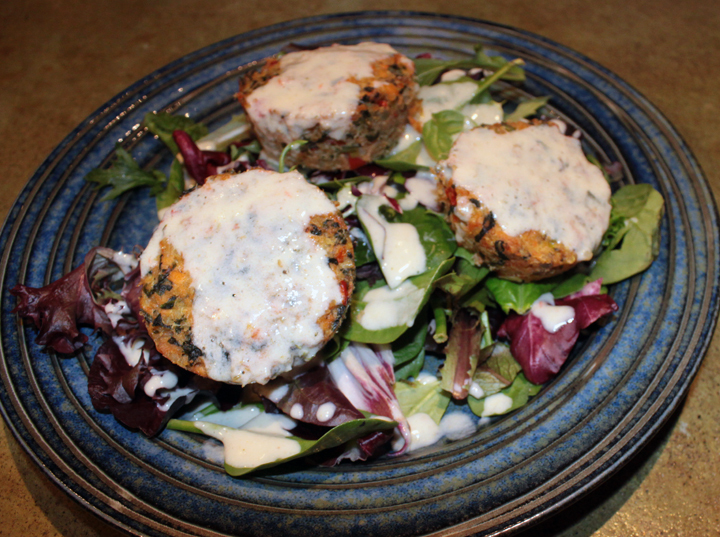 Anyway, these salmon cakes are tasty treat that even we picky folk can love. Lightly oil a baking dish and place the salmon skin side down. Sprinkle with the chipotle powder, lightly grind some salt & pepper, and squeeze 1/2 lemon over the top. Bake 15-20 minutes at 375, until cooked through (you’re going for a solid medium well so it flakes nicely for the cakes). Set aside to cool. 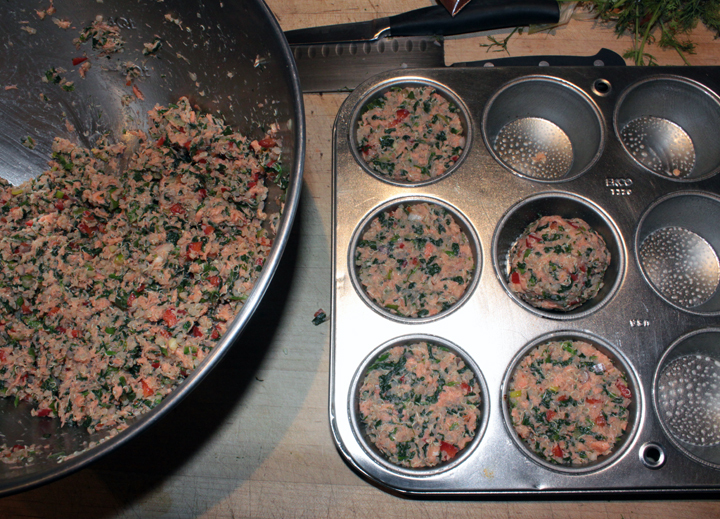 In a large mixing bowl, add the remaining cakes ingredients, then flake the cooked salmon into the bowl (discard skin). Smoosh all together with your hands (this is the best part!) until well mixed. Now you have a choice. A very very hard choice. To bake or to fry. I have to admit I prefer the fried version. But sometimes the lighter seems like a better idea, so we do it both ways, depending on how we’re feeling. For frying, pour a hearty layer of olive oil in a large frying pan and heat on medium/medium high (you want it hot enough that the cakes start sizzling nicely the moment you put them in). Form cakes with your hands (about 3 inches x 1 inch) and fry on each side until golden, about 3-4 minutes per side. Add more oil to the pan, as needed. Mix the mayo & chipotle powder together. Pile greens on a plate, drizzle lightly with olive oil, top with a few cakes, squeeze lemon over everything and dollop some chipotle mayo on top of the cakes. These are also tasty with the Roasted Red Pepper Sauce or a creamy horseradish sauce (recipe to come). Enjoy! This entry was posted in Fish, Recipes and tagged Candida Diet, Gluten-Free, Salmon by Brooke Bonner. Bookmark the permalink.